Interest in cryptocurrencies, like Bitcoin, continues unabated, even as market values of these digital currencies has tanked in recent months. 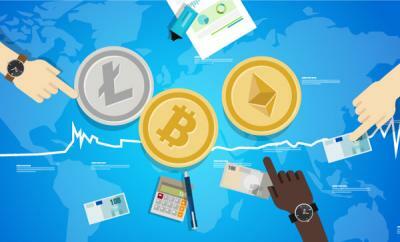 And while there is no groundswell of demand from merchants for cryptocurrency acceptance, proponents believe it's only a matter of time. "There's not a ton of volume right now, but this is coming," said Eric Brown, CEO of Aliant Payment Systems Inc. "The train has left the station and it's going to run over the credit card industry if it's not prepared." Aliant, headquartered in Ft. Lauderdale, Fla., is one of a handful of merchant services providers offering cryptocurrency processing. In May 2018, Aliant revealed it had been selected by iPayment Holdings Inc. to facilitate cryptocurrency acceptance by iPayment merchants. Shortly after, iPayment was acquired by Paysafe Group. Headquartered in the United Kingdom, Paysafe made its own foray into the cryptocurrency space this year, launching a cryptocurrency exchange by its online payments subsidiary, Skrill. That service currently supports purchases and sales of four different cryptocurrencies in 36 counties, but not the United States.Brown said the arrangement with iPayment (now rebranded as Paysafe) hasn't been affected by the acquisition. "We're still working with iPayment merchants," he said, adding that the company also is "in discussions" with Paysafe about expanding the relationship. Aliant has about 30 merchant level salespeople (MLSs) signed up and selling cryptocurrency processing services. "It's another tool in their toolkit to go out and sell," Brown said. He said the company is boarding about five to seven new merchants a week, adding "We expect that to ramp up." There are several brands of cryptocurrency, including Bitcoin, Bitcoin Cash, Ethereum, Litecoin and Ripple. Aliant supports payments in Bitcoin (the largest), Ethereum and Litecoin. Brown said Aliant has developed a direct cryptocurrency plugin for two of the largest ecommerce platforms, WordPress and WooCommerce, and it can create custom application programming interfaces for integrating with others. Aliant also offers a cryptopayment button for the Poynt smart mobile POS device. At 3.5 percent plus 10 cents per transaction, the fees Aliant charges merchants accepting cryptocurrencies undercut those charged high-risk clients for credit and debit card payments, Brown noted. Also, there is no risk of chargebacks when accepting cryptocurrencies, and there are no reserve requirements, Brown added. Yet another draw for businesses: no card or personal financial information gets collected when customers pay by cryptocurrency. To protect against market volatility (the value of a single Bitcoin fell by nearly 50 percent between April and mid-September 2018), processors like Aliant lock in the crypto-to-dollar exchange rate at the point of payment, typically for 15 minutes. Enthusiasm over cryptocurrency acceptance is strong among ecommerce and other card-not-present merchants. "That's where most of the interest is right now," Brown said. "We've seen this happen before." In the early days of online commerce most of the transactions involved high-risk activities, like adult entertainment and gambling, he noted. A few years later, Amazon was born, and mainstream retailers soon followed with ecommerce plays. Today, ecommerce is a thriving market. The website eMarketer expects retail ecommerce sales in the United States to total nearly $253 billion this year; Forrester Research expects ecommerce to account for 17 percent of all U.S. retail sales by 2022. Brown pointed to several merchant verticals where Aliant's sales team and partners have made inroads, including high-end automobile dealers (think Lamborghinis) and travel services firms. Aliant already sells payment services in both, as well as other high-risk verticals. "Cryptocurrency is an ideal payment method for ecommerce and industries like technology, electronics and jewelry, where the risks of chargebacks, fraud and identity theft are high," said Jan Jahosky, a spokesman for the cryptocurrency pure play BitPay. "Gold bullion, travel, philanthropy and gaming are part of the next group of early adopters of cryptocurrency." BitPay works directly with businesses; it has no ISO or MLS relationships. The company charges businesses 1 percent of the transaction amount for processing cryptocurrency payments. Businesses can choose to accept the net proceeds in Bitcoins, as U.S. dollars deposited to their bank accounts, or a combination of the two. BitPay processed $1.2 billion in payments last year, and $591 million during the first six months of 2018, Jahosky said. He added that BitPay has signed "hundreds of thousands" of businesses worldwide for cryptocurrency acceptance. Cannabis dispensaries, which due to a combination of federal laws and card-brand prohibitions are primarily cash-only businesses, represent another potential market for cryptocurrencies. Israel-based Virtual Crypto Technologies Ltd. said it is preparing to roll out a cryptocurrency POS solution later this year designed specifically for U.S. cannabis dispensaries. "We believe our technology can ultimately reduce the amount of cash moving through the cannabis ecosystem, which will help foster a safer work environment and ensure industry participants pay their taxes using an alternative payment method," stated Alon Dayan, the firm's CEO. Virtual Crypto also deploys crypto-ATMs, which can be used to buy and sell cryptocurrencies. Presently, there are fewer than 4,000 crypto-ATMs worldwide, according to Coin ATM Radar, a website that keeps tabs on the market. Today, according to published reports and processors, more than a dozen big-name companies are accepting Bitcoin and/or other cryptocurrency as payment for goods and services. These include travel websites Expedia and CheapAir, Overstock.com, gift-card platform Gyft, Microsoft, Shopify, satellite TV and Internet services provider Dish, and online food delivery marketplace Takeaway. In addition, Intuit supports cryptocurrency payments as part of its QuickBooks Online electronic invoicing service. One local government, Seminole County, Fla., began accepting cryptocurrency tax payments, using BitPay this year. The county accepts Bitcoin and Bitcoin Cash for a variety of services, including property taxes, driver license and ID card fees, tags and title taxes. Jahosky said BitPay also is in discussions with several city governments interested in accepting cryptocurrency tax payments. Cryptocurrencies are based on blockchain, or distributed ledger technology, which is essentially an open, online spreadsheet. Blockchain boasts transactional transparency, as every transaction is verified, recorded and stored; once recorded it cannot be altered. Users send the exact amount of cryptocurrency needed to effect payment. Blockchain is a versatile technology that can support more than financial transactions, and there appears to be broad interest in applying the technology to track flows of information and goods. "Ultimately, it's more of a business enabler, than a technology," the international consulting firm Deloitte said in reporting results of a recent survey of corporate attitudes toward blockchain. Among large corporate executives surveyed, 78 percent said they believed their organizations will lose competitive advantage lest they implement blockchain. Steve Larke, partner in the technology consulting practice at Deloitte, said blockchain will usher in the most significant changes in the retailing and packaged goods markets. The disruptive nature of blockchain generally, and cryptocurrencies in particular, has not been lost on governments. The Securities and Exchange Commission, for example, has taken the position that cryptocurrency tokens traded on cryptocurrency exchanges should be treated as securities. Meanwhile, several states have enacted laws and regulations regarding cryptocurrencies. In New York the state government authorized the licensing of cryptocurrency firms. Only a handful of firms have received licenses to date, including BitPay. Licensees are subject to the same strictures that apply to other regulated financial firms, including capitalization, know-your-customer, anti-fraud and cybersecurity policies. Several other states have licensing requirements (Connecticut, New Mexico, North Carolina, Oregon and Pennsylvania are among them), several specifically exempt cryptocurrency companies and exchanges from regulation (Illinois, Kansas and Missouri), and still others (like Hawaii) ruled these business violate state money transmitter laws. Lawmakers in California recently passed two bills that relate to blockchain and cryptocurrencies; both are awaiting final sign-offs by the governor. The legislation defines blockchain and cryptocurrency, and amends several of the state's commercial laws to incorporate blockchain technologies. It also would establish a state working group to examine potential benefits of blockchain to the state and come up with a regulatory game plan. Detractors complain, however, that lawmakers stripped out provisions in the legislation that would have created a licensing structure, placing cryptocurrency firms operating there in a perpetual state of regulatory limbo. "At the very least we would expect the creation of a new 'enrollment program' would take the place of money transmission licensing, thus providing clarity," Jerry Brito, executive director of Coin Center, a Washington, D.C.-based research and advocacy center focused on blockchain technologies and cryptocurrencies. Coin Center isn't alone in the nation's capital. In September 2018, a group of cryptocurrency and blockchain companies formed the Blockchain Association to lobby lawmakers and regulators. How effective is third-party telemarketing?